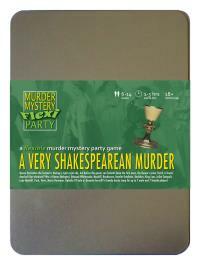 You've been invited to play the role of LADY MACBIFF in A Very Shakespearean Murder. What scream through yonder window breaks? Queen Derivative the Second is having a right royal ado, but before the guests can forketh down the first oxen, the Queen’s jester Yorick is found dead-ed! Join us to find out who-duneth-it! Clad in a long, tight-fitting red dress with embroidered gold belt, you exude dignity and authority - just as the Queen of Scotland ought. You wear a tartan sash, a stunning gold necklace to accentuate your cleavage and, of course, a crown. I am Lady Macbiff of the clan Macbiff, and the wife of King Macbiff - last time I check-eth. Alas, poor Yorick, I knew his smell. He shall not be missed. Why King Macbiff wanted him around the castle I shall not know. Yorick was our jester, and an odious one at that. Flowers wilted in his presence. The stench is not on my hands though - Macbiff and I retired to bed early, plotting and jotting.